When electricity is generated by burning fuel such as gas or coal in power stations, the main byproduct of generation – heat – is often wasted. However, some commercial generators and districts around the world actually distribute the heat generated so that it can be used locally for hot water and/or home and office heating. Such a system design is known as combined heat and power or cogeneration and offers a great leap in efficiency over standard electricity generation and heating systems. Note also that if the fuel burned is waste biomass, or wood chips for example, then it is possible to generate both electricity and heat in a relatively carbon neutral manner – the only carbon footprint coming from transporting the fuel to the generator rather than from the (carbon-neutral) fuel itself. Micro-CHP is the name commonly given to combined heat and power systems designed for use in individual homes – acting as a mini power station. 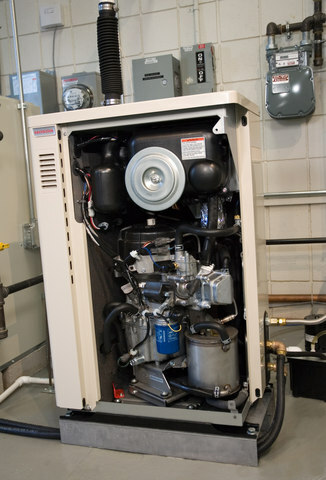 These are typically set up to burn mains gas and generate both heat and power. At the centre of a micro-CHP system is a Stirling engine – a form of external combustion engine which converts heat (generated by burning gas) into mechanical power (used to turn a turbine to generate electricity). Since the maximum electricity output is usually just 1-2kW (compared to the 3kW required by just one kettle, and much more by an electric oven), a micro-CHP system is usually treated as a “boiler which generates electricity” – i.e. it will make all the hot water you need to run baths and showers, central heating, and/or under floor heating as per a standard boiler, while also generating electricity. In order to work efficiently, a micro-CHP system should ideally be left running all the time (unlike modern combi-boilers which fire up each and every time the hot tap is turned on). By connecting the system to the National Grid, generated electricity (which is typically cheaper than mains electricity per unit) can be exported 24 hours per day making the home-owner some money, and hot water is always available. Gas burned in a micro-CHP system generates electricity very efficiently – more efficiently than centralised gas-fueled power stations. By generating and using the electricity at home, there are no transmission losses so overall efficiency is even better. The efficiency of a micro-CHP system can be over 85% which compares very favourably to the best conventional power stations which manage just 50-60% efficiency. The electricity, if not used in your home, will likely be used by one of your neighbours, so although they will not notice the difference, they will be using more efficiently generated and transmitted electricity! For more information about combined heat and power in the UK, click here to visit the website for the Combined Heat and Power Association. 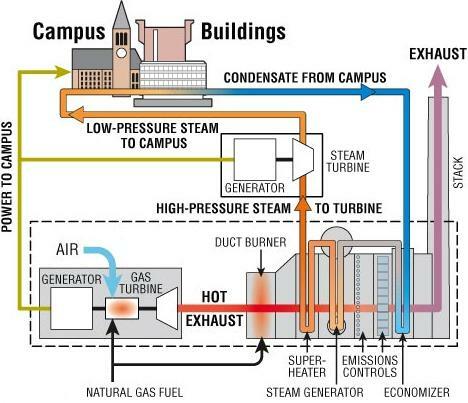 Click here to view the Wikipedia article on Cogeneration.